The Indiana Mennonite Conference traces its roots to the first organized Mennonite congregation that began in 1848. Although a scattering of Mennonite families from Ohio and Pennsylvania had settled in Elkhart County prior to this time, there were no ordained leaders among them. In 1845, eighty-five year-old bishop Martin Hoover, along with his son John and family and two other Mennonite families, moved from Medina County, Ohio to Elkhart County, Indiana. More than two dozen Mennonite families joined Elkhart Count's burgeoning Mennonite community that year. With the increasing Mennonite population, holding church services in private homes became impractical. 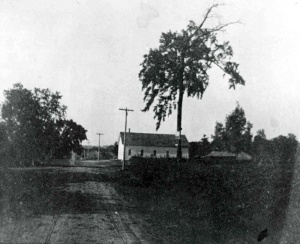 In 1849 the Elkhart County Mennonites built their first meeting house. It was a log building 16 X 16 and was named the Yellow Creek Mennonite meetinghouse. 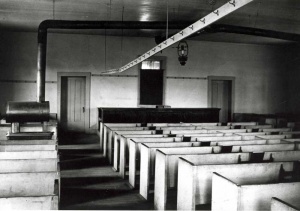 By 1862, the Indiana Mennonite Conference added five additional meetinghouses. The second meetinghouse was also a log building that was located on preacher Jacob Christophel's farm. Upon its completion in 1850, it became known as Christophels. The third meetinghouse was completed in 1851 and measured 24 X 34. It became known as Holdemans. Another log meetinghouse known as Clinton, was the fourth meetinghouse to be erected. Between 1861 and 1862, the Shaum meetinghouse was constructed as a wood frame building. It was the first wood frame meetinghouse for the Indiana Mennonite Conference. Also in 1861, the old Yellow Creek meetinghouse was moved to Union Township where it was renamed Blossers. Among the early Ohio Mennonites who joined the Yellow Creek congregation were two preachers, Jacob Wisler, age 39, and Jacob Christophel, age 66. On Ascension Day, 1 June 1848 these two preachers, along with bishop Martin Hoover, conducted the first services for the Yellow Creek congregation. Since at this time there was no meetinghouse, the services were held in a local school house. Preacher Wisler delivered the main message, with an opening given by preacher Christophel. Testimony affirming the two messages was offered by bishop Hoover. During this first church service there was no singing because no one present felt capable of starting a song. Within almost a 20-year period, the Indiana Mennonite Conference expanded into six congregations under the conservative leadership of bishop Martin Hoover and then his successor, bishop Jacob Wisler. Mennonite custom and tradition were closely adhered to, thus creating unity among the conference members while the "worldly" virus of Protestant pietism was kept outside the walls of the Mennonite culture. In 1867 John F. Funk moved to Elkhart County, Indiana and, with him came the strain of the Protestant pietism virus which would eventually infect most of the Indiana Conference Mennonites. By 1869, Funk had forced bishop Jacob Wisler's withdrawal from the Indiana Mennonite Conference. In 1871, Jacob Wisler, along with about a 100 like-minded Mennonites, agreed to retain and promote the Old Mennonite church customs. It was this action that formed the Old Order Indiana Mennonites, who would soon be known as the Wisler Mennonites. Yellow Creek meetinghouse, ca. 1910. Photo courtesy of Archives of Mennonite Church USA. After the 1871-1872 division, the Yellow Creek Mennonite meetinghouse was used on alternating Sundays by the Indiana Conference Mennonites and the Wisler Old Order Mennonites until 1912. On 12 May 1899 John W. Martin was ordained bishop for the Wisler Old Order Mennonite church. In 1907, another division occurred among the Old Order Elkhart County Mennonites. The conservative side was led by bishop John W. Martin, who prohibited the telephone and electricity to both clergy and laity. In a few short years, the ownership of automobiles was also prohibited. This group of Old Order Mennonites was labeled the John W. Martin church. The more liberal group, which permitted the use of electricity and telephone and which allowed automobile ownership, was called the Ramer Mennonites. In spite of the 1907 division, the John W. Martin Mennonites and the Ramer Mennonites used the Yellow Creek and the Blosser meetinghouses on alternating Sundays. On 19 May 1934, Joseph E. Martin was ordained bishop for the John W. Martin church where he served until 1948 when he left the John W. Martin church. He joined the William Ramer church and soon became a preacher. Later, on 2 June 1953, William G. Weaver was ordained to fill the office of bishop that had been vacated by Joseph E. Martin. In the fall conference of 1971, the John W. Martin church membership agreed to merge with the Groffdale Old Order Mennonite Conference, if they would be accepted. The John W. Martin church was concerned that they would not be allowed to retain their existing ordnung. The Lancaster County Groffdale Old Order Mennonite Conference agreed that the John W. Martin church could retain their existing ordnung, with the stipulation that they would comply with any additions or deletions put into effect by the Groffdale Conference beginning from the date of the merger. During their 1972 spring conference, the Lancaster County Groffdale Old Order Mennonite Conference accepted the proposed merger. Since that time, the two groups have achieved a unity of oneness. Nevertheless, in 1981, bishop William G. Weaver withdrew from the Indiana Groffdale Conference church (known as the John W. Martin church until the 1972 merger) over the use of pneumatic tires on skid-steer loaders. To fill the office vacated by bishop Weaver, Elvin M. Martin was ordained as the new bishop. Beginning in 1983, the members of the former John W. Martin church began to strongly avoid and to discourage the use of the name “John W. Martin people.” They preferred to be known as the Indiana Groffdale Conference people. As of 1 January 2011 the following ministry team served the Elkhart County (Indiana) Groffdale Old Order Mennonite Conference. The bishop was Elvin M. Martin (ordained minister, 1961; bishop1983). The ministers were David W. Imhoff (ordained 1972), Christian G. Weaver (ordained 1976), Allen S. Nolt (ordained 1984), Enos K. Ramer Jr. (ordained 1993), and James M. Martin (ordained 2007). The deacons were David R. Zimmerman (ordained 1977) and Raymond M. Martin (ordained 2001). These ministers and deacons alternated every Sunday in all three meetinghouses, but held services in only two meetinghouses each Sunday. As of 1 January 2011 there were approximately 120 households in Elkhart County. The Yellow Creek meetinghouse is located along County Road 38 in Elkhart County. It is a wood frame building erected in 1861 and expanded in 1954. Then in 1959, this building was sold to the Ramer Church group. Later in 1959, the John W. Martin group built a new Yellow Creek meetinghouse along County Road 38, some distance from the old meeting house. The size of this meetinghouse is 40 feet by 56 feet. Blossers meetinghouse was a wood frame building built in 1891 along County Road 46. Its measurements were 42 feet by 54 feet. The Clearland was a wood frame building built in 1975 along County Road 36. Its size was 40 feet by 45 feet. Martin, Jonathan H. "Elkhart County Old Order Mennonite Settlement (Indiana, USA)." Global Anabaptist Mennonite Encyclopedia Online. February 2012. Web. 21 Apr 2019. http://gameo.org/index.php?title=Elkhart_County_Old_Order_Mennonite_Settlement_(Indiana,_USA)&oldid=113344. Martin, Jonathan H. (February 2012). Elkhart County Old Order Mennonite Settlement (Indiana, USA). Global Anabaptist Mennonite Encyclopedia Online. Retrieved 21 April 2019, from http://gameo.org/index.php?title=Elkhart_County_Old_Order_Mennonite_Settlement_(Indiana,_USA)&oldid=113344.